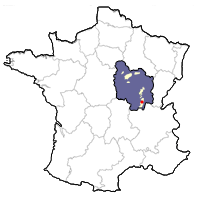 Viré-Clessé is the northernmost of the top-level AOCs within in the Mâconnais area of southern Burgundy. Other Mâconnais AOCs include Pouilly-Fuissé, Pouilly-Loche, Pouilly-Vinzelles and Saint-Véran. The villages Viré and Clessé were originally permitted to call their wines Mâcon-Viré or Mâcon-Clessé. The quality of these wines, produced exclusively from Chardonnay, began to escalate in the latter part of the 20th century. Some growers recognized the best of their wines could rival those of their more known and expensive neighbors in Pouilly-Fuissé. Because the wines of Viré and Clessé closely resembled each other, it was decided to roll them into a single appellation. They applied for separate appellation status in an attempt to distance themselves from the more generic Mâcon classification. Created in February 1999, the Viré-Clessé appellation was intended to single out the small area capable of producing white wines of quality. This new AOC elevated the Viré and Clessé wines to a new level. New rules regulating yields (decreasing them from 70 hl/ha to 50 hl/ha) as well as residual sugar levels (to less than 3 grams per liter) immediately enhanced quality. The Viré-Clessé appellation covers 430 hectares, including vineyards from the villages of Laizé, Montbellet, Viré and Clessé communes. The AOC spans two gentle slopes that run north to south between the Bourbonne and Mouge valleys, where altitudes range between 200 and 440 meters. These vineyards are less steep than in neighboring Pouilly-Fuissé. Approximately 250,000 cases (about half that of Pouilly-Fuissé) are produced a year. The names Mâcon-Viré and Mâcon-Clessé have been abandoned and fell out of use around 2002. The soil in the Viré-Clessé AOC contains less iron than that of Pouilly-Fuissé. It's primarily Jurassic limestone that contains some marl. Clay lies at the foot of the slopes. Mixed in are sandstone pebbles known as chailles. Cray (white limestone pebbles typical of the Mâconnais) insures proper drainage. ​Wines from Viré-Clessé display a honeyed richness quite unique to the area. They can offer aromas of acacia flowers and exotic fruits. On the palate, honeysuckle, lemon, white peach, and mint often surface. As the wine ages, quince jam and honey make an appearance. Lively and fresh yet well-rounded, the best examples always have a mineraled undertone. Viré-Clessé wines are a good match for veal or pork dishes, as well as roasted chicken or fish. Its unctuousness also works well with cow milk cheeses like Camembert or Brie.